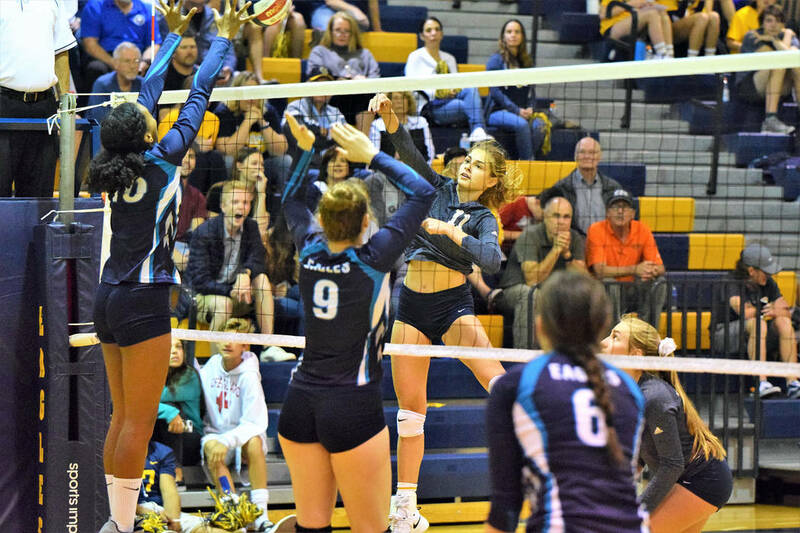 Boulder City High School sophomore Kamry Bailey was named the 3A All-Southern Region player of the year for her efforts in guiding the Lady Eagles to their second consecutive 3A state girls volleyball championship. Robert Vendettoli/Boulder City Review Sophomore Kamry Bailey slams down an offensive strike against Sky Pointe on Oct. 24, 2017. Establishing herself as the top girls player in Southern Nevada, Bailey also was named All-Sunrise League player of the year. Following in the footsteps of former great Lady Eagle Maggie Roe, who was named last season’s 3A player of the year, Bailey blossomed into a star this fall, generating 350 kills, 198 digs, 101 serving aces and 27 blocks. For her efforts, she was named a first-team All-Southern Region selection alongside sophomores Sierra Orton and Ava Wright. Breaking out as a two-way threat, Orton teamed up with Bailey to deliver 214 kills offensively while making 66 blocks on the defensive end. Making the All-Southern Region second team were junior Raegan Herr and sophomore Kelsi Robinson. Another key offensive contributor, Herr tallied 179 kills, 43 blocks and 31 digs, while Robinson generated 153 kills and a team-high 92 blocks. Leading the Lady Eagles through an undefeated league season, Bailey, Herr, Orton and Wright were all named first-team Sunrise All-League selections, while Robinson was named to the second team.